L.M.Reid is an Irish writer who has published many articles. She creates numerous crafts that sell well at craft shows. 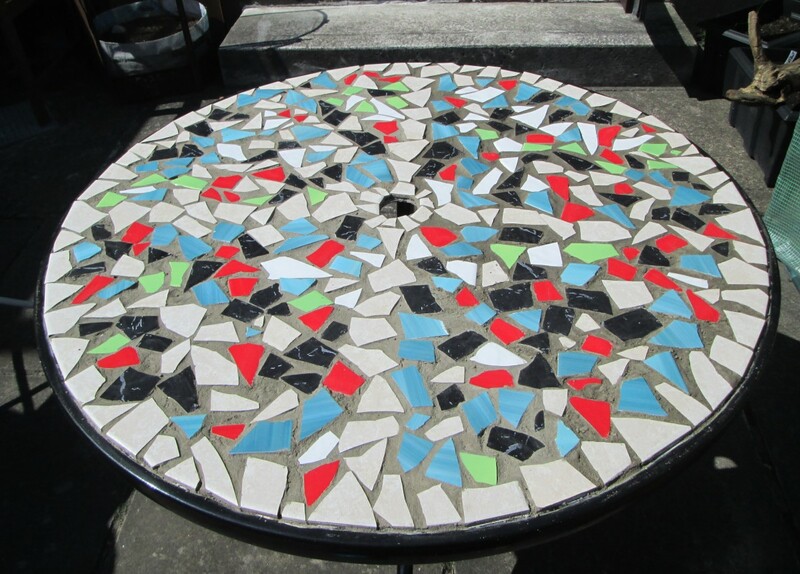 If you have an old table you don't like anymore, why not turn it into something beautiful with a mosaic design? It is easy and fun to put together, and I will show you the steps to follow below. 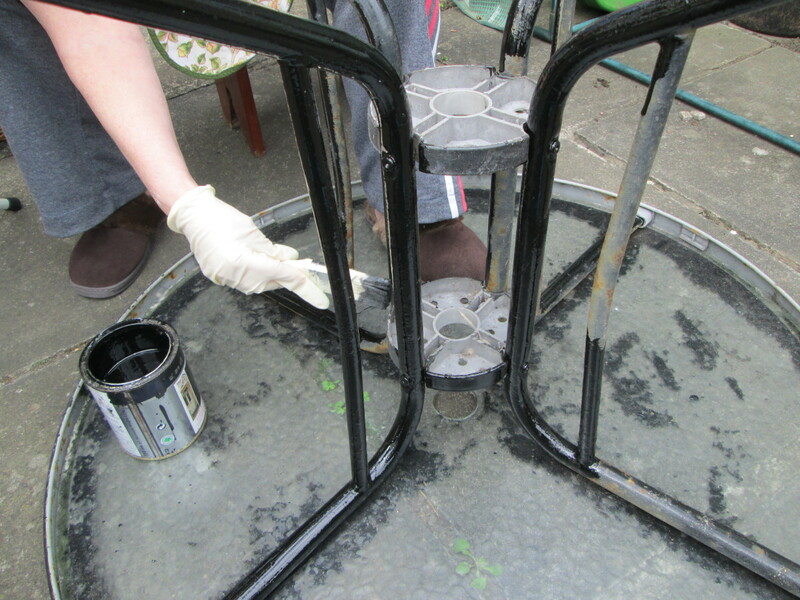 Paint the legs of the table in a colour you like, as well as any surfaces that will not be covered with the mosaic. Let the table dry completely, preferably at least 24 hours. Clean the tabletop thoroughly and make sure it is dry and even. Online at Amazon. There is always a great variety of ceramic tiles here and they are great value too, so this is where I buy mine. Stores: Some places have some odd tiles left over. These are usually put aside in a sale box, so you can buy them at a cheaper cost and individually. Displays: Some shops have samples on display that they either sell at a steep discount or give away. Friends or Family: Ask them if they have any leftover tiles in their garage or attic. Garage Sales: You can buy tiles inexpensively at garage sales, so this is a great option. One important tip is to make sure that all the tiles you get are the same depth. This is necessary so that the table will have a level surface when it's finished. The colours, shapes, and designs can be different. It is up to you to decide how large or small you want your tiles to be for the mosaic. If this is your first mosaic project, I suggest using a mixture of sizes. You will know which size you prefer to work with after you complete your first mosaic. Use a hammer to break the tiles. Tapping them lightly will cause them to break into pieces. You will get used to how much pressure is needed as you go along. Keep all the same colour tile pieces in a separate box. This will make it easier when you go to lay them out for your design. You could also put them in separate groups if you have no boxes handy. 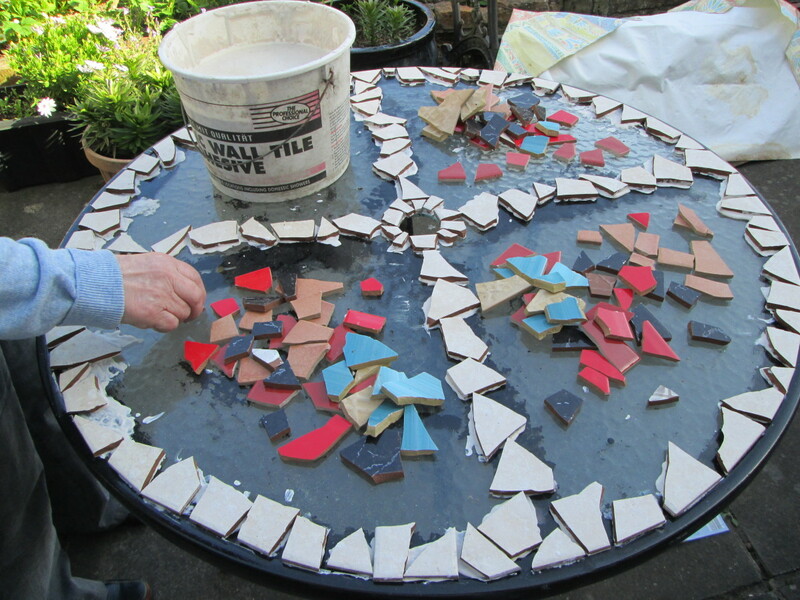 Once the tiles are broken up into pieces, lay some out on the table and create your design. You can put the same colours together or mix them in rows. Use tiles in one colour to form a shape or straight lines. This is your table, so you can decide how to put everything together. 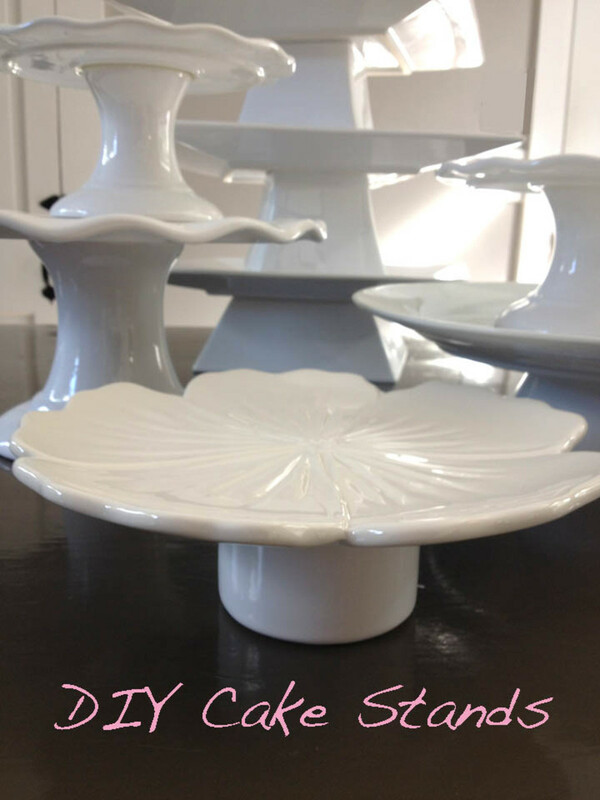 When you are happy with the design, then start gluing them to the tabletop with your ceramic tile adhesive. Cover a small area of the table with glue and press the tiles down. This takes patience, but please do it carefully and evenly. Place the spirit level over a group of tiles you have stuck onto the table at intervals to make sure they are even. Leave them to dry completely for at least 24 hours. Mix the grout with water, following the instructions on the bag. Use a brush or plastic scraper to add the grouting to the tabletop. Cover just a few tiles at a time to prevent the grout from drying out before you can spread it properly. Smooth the grouting in between the tile gaps. Try to make it as even as possible. Continue around the remaining tiles until the tabletop is finished. Start from the place you started adding grout and begin to clean the tiles. 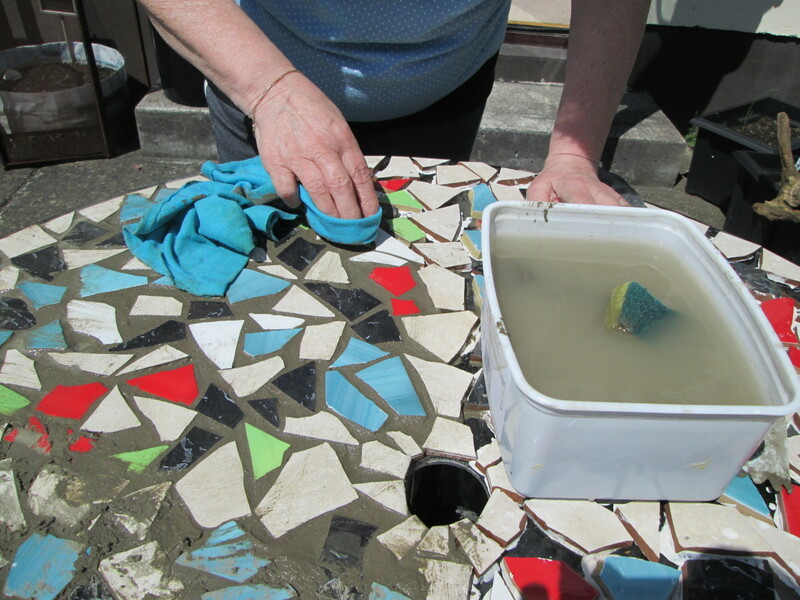 Use the plastic scraper to remove the excess water and most of the grouting. Do this for all the tiles. Get a clean damp cloth or baby wipe and do a final clean. Polish off the tiles on the whole table. After the grouting was left to dry for 24 hours, you need to check on the table. Use the spirit level to make sure the tiles are even. There will be some areas where the space between the tiles is uneven. Mix some more grouting, but make it a thinner consistency this time. Spread the grout over the tiles again, paying attention to any uneven areas. Clean the tiles as you did above and leave it to dry again for 24 hours. Mix the grout sealer as per instructions on the bottle. Mine was five parts water to one part sealer. 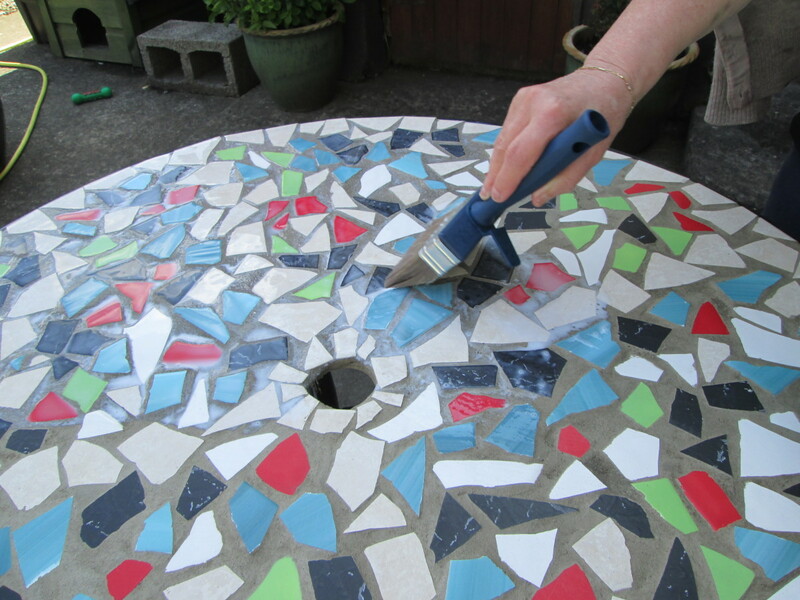 Use a clean paste brush to cover the mosaic with the sealer. It is very watery, so make sure you do not leave puddles in the gaps. Leave to dry for three hours. Add another coat of sealer. This will protect the mosaic tabletop and make it look nicer. When this is completely dry, your mosaic table top is finished! I made the two mosaic tabletops above. Learn how I did it to get more inspiration for your project! With these designs I used tiny square tiles. I already had some and then used these mixed tiles as well. I found them very easy to use and I had lots of colours to choose from. Turn that old sideboard or drawer set into a lovely piece of modern furniture by adding fresh paint and a mosaic design. Make a mosaic on a plain wall in the garden or yard to give it fresh life and colour. Decorate picture frames or old mirrors for a vintage look. Would a mosaic table top work on a wood table? Was that a glass table top you glued the tiles to? If not, can you use a glass table top or what do you use to replace the glass? Yes, the top of the table is made of glass. You can safely glue the ceramic tiles to the glass without any problems. Do I have to glue each piece individually? and what kind of glue do I use? Yes each tile has to be glued with special ceramic tile glue first. Once dry, they are covered in grouting and then with tile sealer. 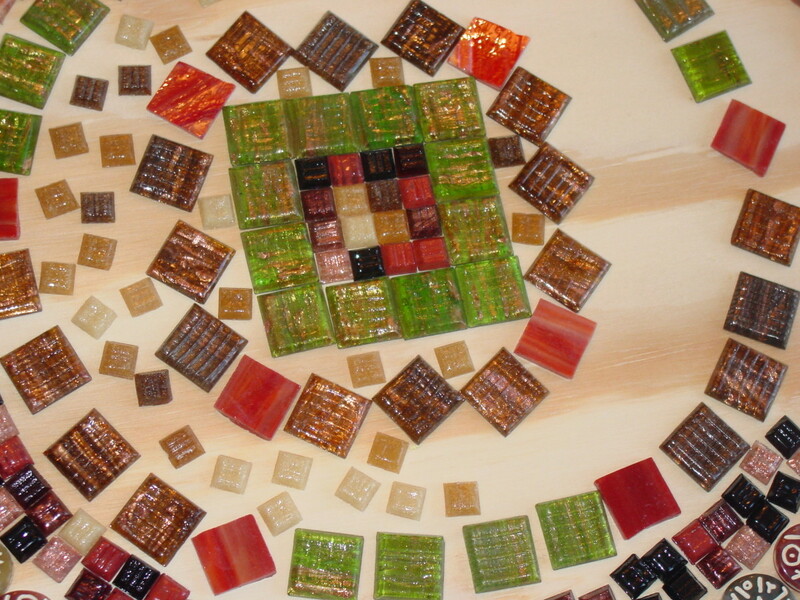 It is worth all the extra work because you can create some really amazing mosaic designs that will last for years. What can I do if the mosaic tabletop filler does not dry? It was probably too thin. Apply more of it again in between the tiles and wait 24 hours. If it is still wet then dry it it with a hairdryer. How did you make the mosaic tiles fit the edge of the table? The ceramic tiles were broken in many small pieces, so I was able to match them to fit the edge. In some parts of the table, there are a few spaces, but that was easily filled in and fixed with the grouting. Will the tile glue still work if I use a table with a wooden top instead of glass? Thank you all for taking the time to read and leave a comment. Sarah, I am not sure about the glass. My table is made of a glass top too but there has been no damage to it. I love this, great article. 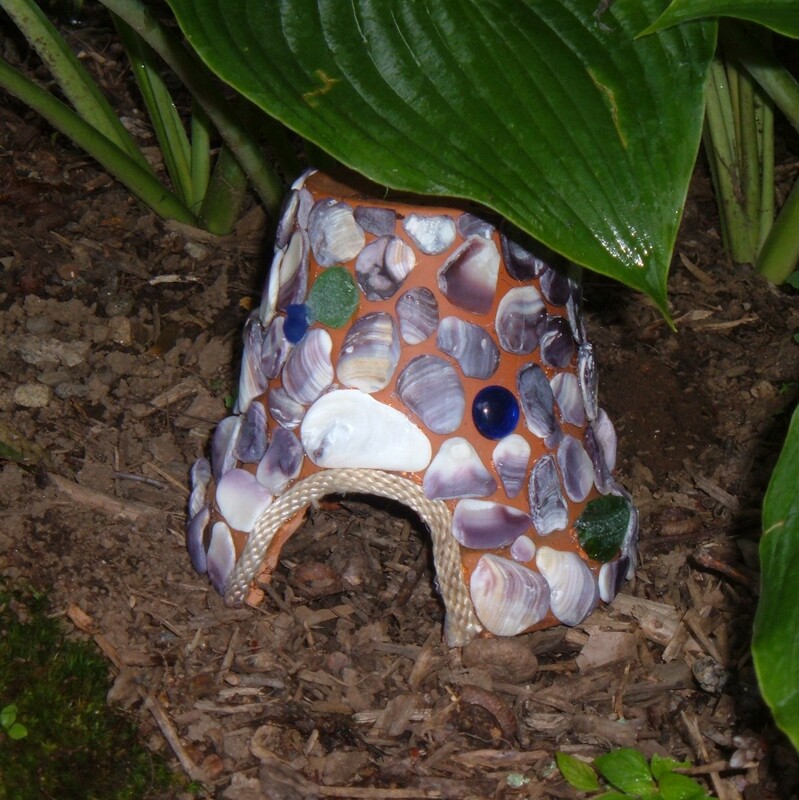 Its been years since I took a mosaic class(bird house, stepping stone with form and cement...Thanks for refreshing me! Get instructions/very clear and love step by step to watch .So much easier this way! 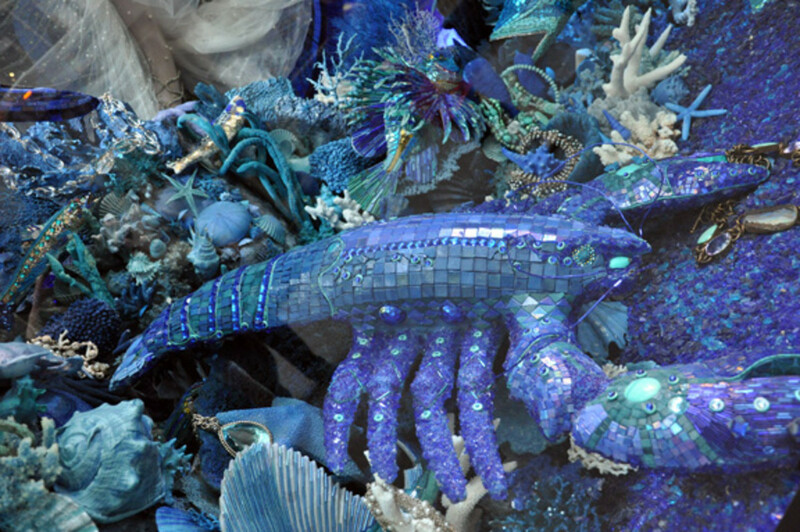 I would like to try this one day with the sea glass I have collected the past 10 years. 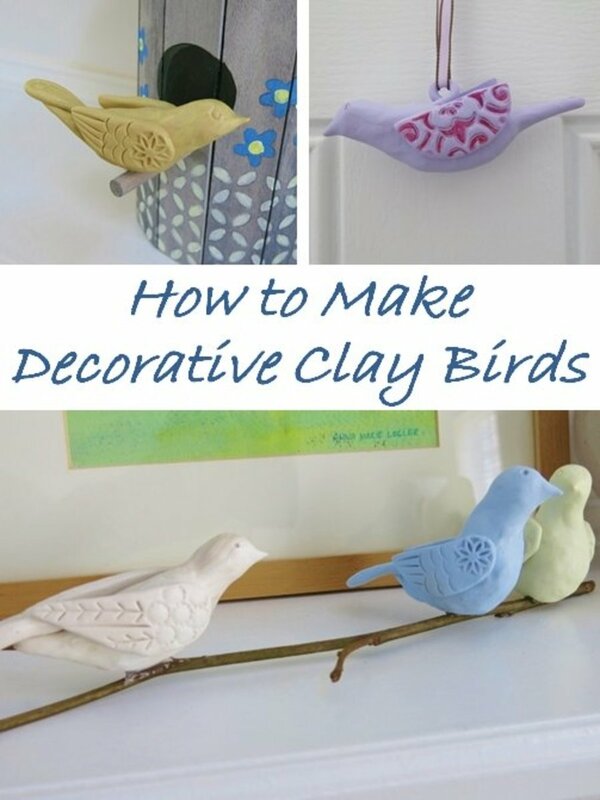 This is a great step-by-step method. I have had no problems with the glass top Patty. If anything I believe the tiles have strengthened the table top. I have a glass top table and I was worried that the tiles would be too heavy. Any issues with that? It is really fun to make but does take a lot of time. Thank you RebeccaMealey and Phyllis Doyle for taking the time to leave a comment. I am glad you liked it. Besarien lol Yes I am planning to do this to one of my garden walls. Yes I did enjoy making this mosaic table top, although it did take a lot of time - worth it though. Mister Hollywood I am glad you like my method of writing and thank you for your kind comments. Breakfastpop I am delighted I have encouraged you to give this a try, it is very satisfying to create something from scratch. This was awesome and so inspiring. I want to do this to tables that I do like! I want to do this to my walls! What a fun project to take on. The table turned out lovely. Voted up, U, A, I and shared. I have been thinking about trying this for quite a long time. Your hub is so detailed and understandable that I think I have the courage to begin. Thank you. Voted up, useful, interesting and awesome! Pretty, pretty pretty! My daughter made one of these for me once. I love it. You make it look so fun and easy. Shared and pinned. Really cool hub and wow - this step by step "how to" is very informative. I will have to remember to come back and check more of your hubs in the future. Very practical and easy to understand. I am voting up! Hello Suzanne Day I am glad you found this article useful. It is well worth the effort for the result that can be achieved with making a mosaic design. Have a go and see how you do. Thanks for the kind comments. Hello Your Cousins, you should give this a go with your spare tiles. It was hard work but I did enjoy it and the finished product was well worth it. Take lots of photos and write a hub about it too. Thank you for your wonderful comments. Hello NWeaver you can buy special paint to paint tiles. Yes starstream, I must admit I only wore my ordinary glasses when smashing up the tiles. I plan doing some more art this spring so will definitely buy some. Thanks for your kind comments. Very good, lot of hard work. Nice and thanks for making this hub. Quite an ambitious project with amazing results. Great hub, voting up, sharing. Wow, what a great hub! 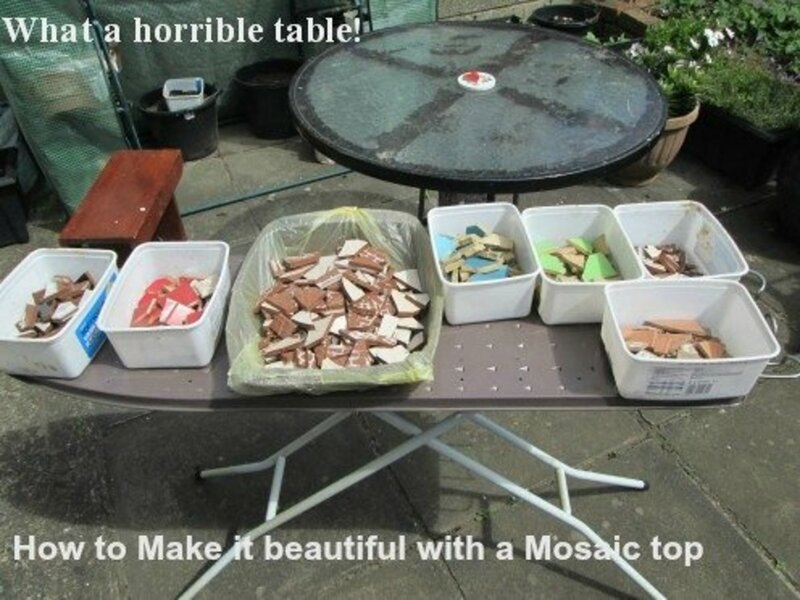 You have put a lot of time and effort into this, creating a mosaic table! I always wondered how to do this properly, and also how to make a mosaic wall and you've shown me how, step by step. Voted up and useful! I love this hub!! Thanks for sharing with all the details. I never knew how this was done. You created a beautiful piece of art. I have some leftover stone tiles in the attic from various floors in house. It would be great to create a table that matches the floor tiles. I am definitely putting this on my to-do list. Your mosaic instructions with pictures are excellent. I found a small amount of tiles at a non profit craft/art recycle outlet. It must be almost one of a kind store. Do wear protective eye glasses! I found an old mosaic tile table with tiles that have faded paint. If tiles are still intact is there a way to repaint tiles? Great hub. I want to make one ASAP. It looks time consuming but I am sure the finished product is worth the effort. You did a great job providing easy to follow steps. Voted up and useful. 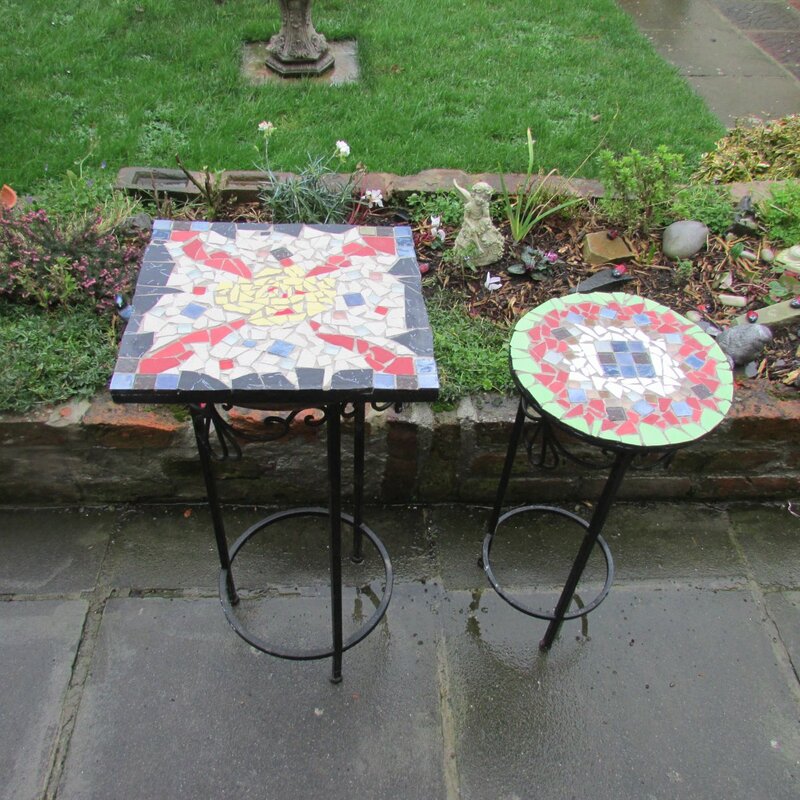 Yes I also enjoyed making the Mosaic for this Garden Table missolive and now plan to do even more. It does take time but worth the end result. Very interesting and educative. It was great to read and watch the pictures as well to get a complete understanding of the process. You did a great job! I've dabbled in mosaics and did my kitchen table. It was a fun project and I'm considering a mosaic for our garden table. 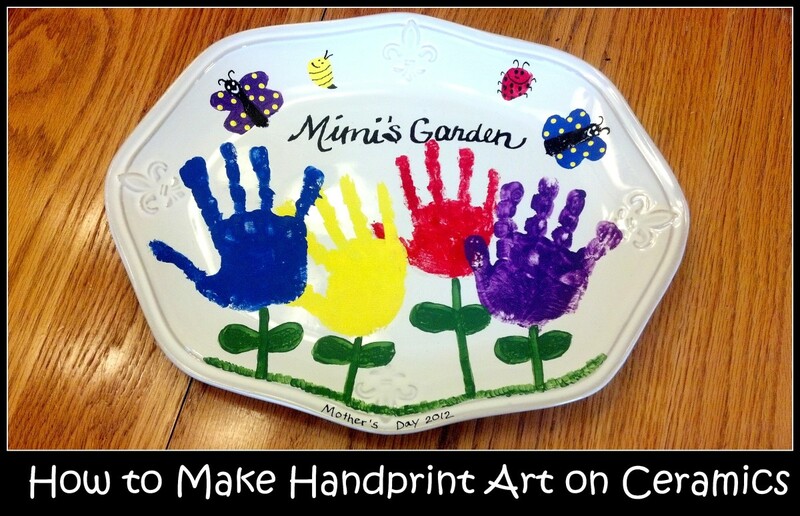 Your instructions and pictures are fabulous, thank you for sharing all of your tips. The videos were a great addition. Voted up! Creating a mosaic pattern on a piece of furniture is fun and very creative. It is amazing how it transforms the table. Awesome!! The step by step procedure is really helpful. Great hub and very well explained. Might have a go at it myself I have a few pieces of old furniture that could do with a bit of TLC. I enjoyed making the mosaic table top but it did take a lot of time. I plan doing other projects soon too with the left over tiles.